On Tuesday night, I attended a fascinating lecture by Stanley Ginsberg, co-author of Inside the Jewish Bakery: Recipes and Memories from the Golden Age of Jewish Baking . Ginsberg has a diverse background, including a Ph.D. in Chinese literature and a career in marketing and financial writing, but he hungered for the Jewish foods of his childhood. An amateur baker, he found his co-author, Norman Berg (who died in May), on a baker’s forum on the Internet and asked for the one item he savored most, onion rolls. Berg, a Bronx native and a retired baker, provided a recipe and it came out great. Next was the Russian coffee cake, with its New World extravagance of butter, cinnamon sugar, nuts, and apricot syrup. The two of them, living on opposite coasts, embarked on a journey of nostalgia and research and culminated in a thick volume packed with tangible sweet and savory memories of our Jewish communities. What is a Jewish bakery? Well, you may simply think of it as a bakery using Jewish recipes, serving Jewish customers. But, it is also a living document of the Jews who lived under the Holy Roman Empire as they moved up the Rhine Valley, then eastward towards the Pale of Settlement, established in 1791 by Empress Catherine (the Great), consisting of western Russia and Poland. We have linguistic souvenirs of their odyssey, such as bentching which derives from the Latin for benediction, and we have culinary artifacts. Challah, which American Jews think of as our unique Sabbath bread, was also eaten by 14th century German Christians. (The Sephardim had no special bread for Shabbat, maybe because of the Inquisition and the remaining hidden Jews’ need to hide their ritual observance.) The decorated challah comes from Czechoslavkia, Bohemia, and the Balkans, where they had the custom of decorating their holiday breads with symbols. Many of the items featured in the book are no longer found in our bakeries, such as kornbroyt (corn rye), poppy horns, and bialys, for which no machine has been devised. Other recipes are for authentic, labor-intensive methods that commercial bakeries now eschew or substitute with time-saving or cheaper replacements. A poignant example is the sad decline of the mass-produced bagel. In the early 20th century, the International Beigel Bakers Union of Greater New York and New Jersey had a tight monopoly; you couldn’t break into the business unless your father or father-in-law were themselves bagel bakers. Ginsberg writes: “In the 40’s and 50’s, it was said, a Jewish boy could more easily get into medical school than become an apprentice bagel baker.” And we all know about the exclusion of Jews from medical schools. The stranglehold was broken by three men: Mickey Thompson and his son Daniel who devised a bagel-making machine in 1962 and Murray Lender who expanded his market by distributing bagels through local grocery stores, thus introducing the bagel to “consumers of all ethnicities.” The new machine could produce a mind-numbing 300 dozen bagels an hour with one unskilled operator. Lender bought the first six machines manufactured by the Thompsons. However, mass production necessitated changes in the recipe. The original stiff dough clogged the machines, so they increased the water content up to 65%. The resultant dough was now soft and stuck to the machines, so they added oil to soften the crumb. “If challah was the queen of the Shabbes table,” writes Ginsberg, “rye was the poor but honest yeoman who served during the other six days of the week.” This is another example of the decline of quality: rye flour is more costly than wheat flour, so rye bread is now often made with only 10% rye with the addition of caraway seeds. Pumpernickel is a generic term for dark rye bread, but nowadays it’s colored with coffee or caramel coloring. Inside the Jewish Bakery offers step-by-step instruction, including the sequential timing of recipes, such as the implementation of the same sweet Vienna dough for the first rising, making onion pockets, then another hour’s proofing, shaping sandwich bread, and, with the final hour’s rising and with the gluten fully developed, making kaiser rolls. Ginsberg now calls San Diego home, but he was a lay leader of Har Zion while Rabbi Gerald Wolpe was alive. His wife, Sylvia, is a Philadelphia native and they still have family ties here. Ginsberg is a ready story-teller and a walking encyclopedia of food facts. What is the difference between rugelach and schnecken? The former is made from triangles rolled up like croissants while the latter is made from long rolls that are sliced before baking. While mandelbroyt is baked only once and contains almond paste, kamishbroyt is baked twice, like the Italian biscotti. Inside the Jewish Bakery includes complicated charts listing ratios of ingredients, and not simply volumes (as lay people use) or weights (as professional bakers use). The book won the 2012 Jane Grigson Award given by the International Association of Culinary Professionals for distinguished scholarship in the quality of its research and presentation. My copy is from the first printing in May 2011 and it’s full of errors, but the website, www.insidethejewishbakery.com/, has a downloadable list of errata as well as nifty videos on how to shape a four-braid and six-braid loaf of challah. Ginsberg also runs a baker’s supply website, www.nybakers.com, where you can find ingredients not available from your local supermarket, such as medium and dark rye flour, malt syrup, dehydrated chopped onion, and nigella seed. This lecture, held at the Gershman Y, is part of the “What is Your Food Worth?” series coordinated by Temple University’s Feinstein Center for American Jewish History. Upcoming programs include: “Just a Pinch: An Unofficial History of Jewish Cooking in America” at the National Museum of American Jewish History on the 24th at 6:30 pm and “They Were What They Ate: Immigrant Jews and the Encounter with America,” at Gladfelter Hall, Temple University on the 30th at 3:30 pm. 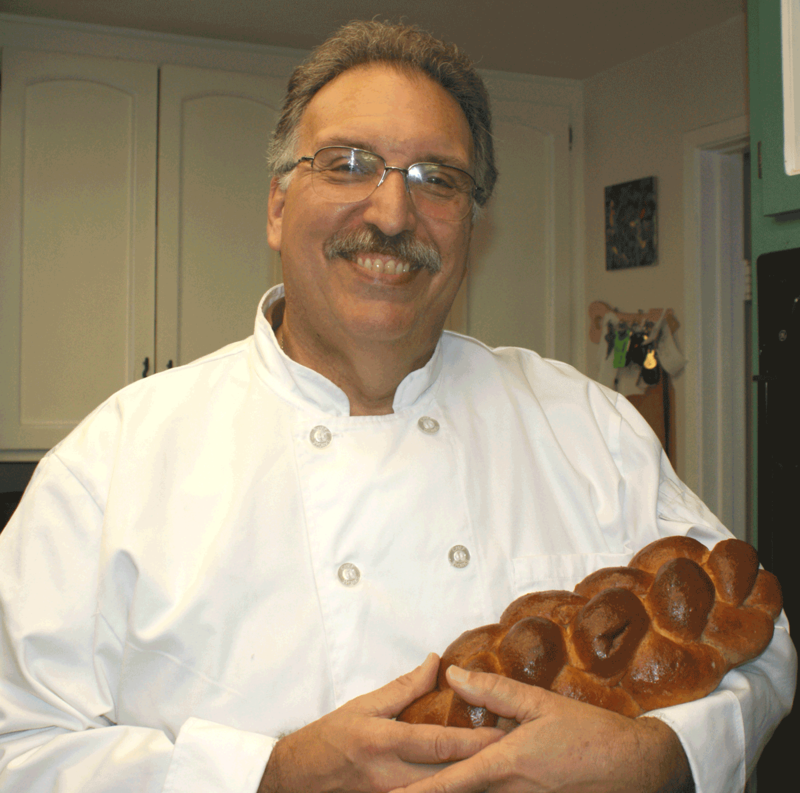 For a complete calendar and on-going conversations about Jewish foodways, log onto www.whatisyourfoodworth.com or www.temple.edu/feinsteinctr.